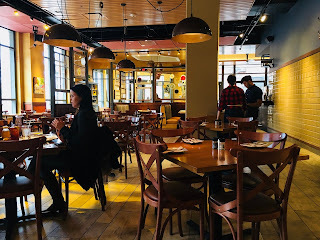 I wanted to go out and celebrate with my colleagues, so I searched for a nice, business lunch appropriate restaurant in the Courthouse area of Arlington. 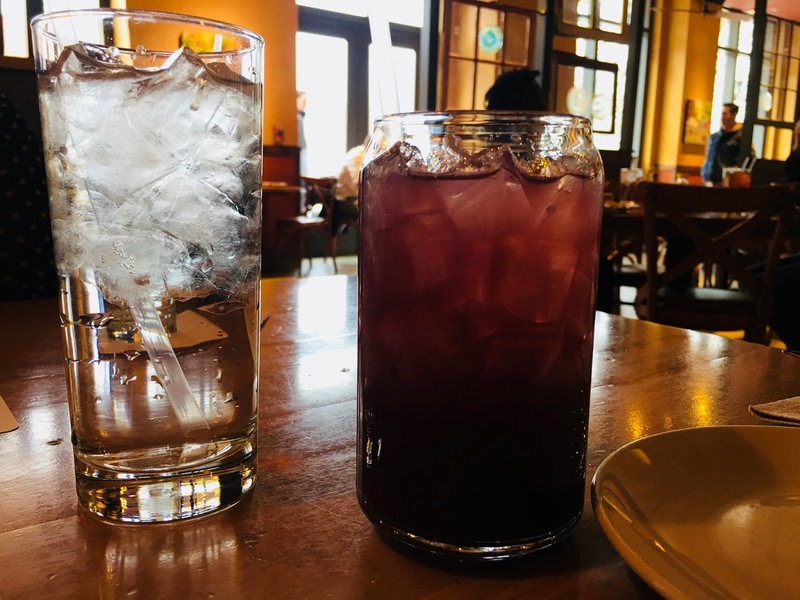 Tupelo Honey was recommended by others at work, but I figured that a Southern restaurant wouldn't have much for me. Searches on the internet confirmed it was not very vegan friendly, but mentioned that the burger there was vegan. And, honestly, I'll try a place that has just one vegan item just to see if it is good. 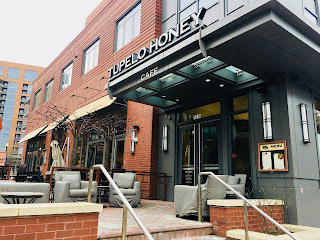 So, off to Tupelo Honey we went! 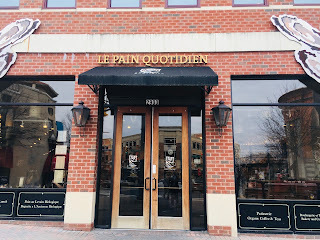 In my research, I discovered that this restaurant originated in Asheville, North Carolina. 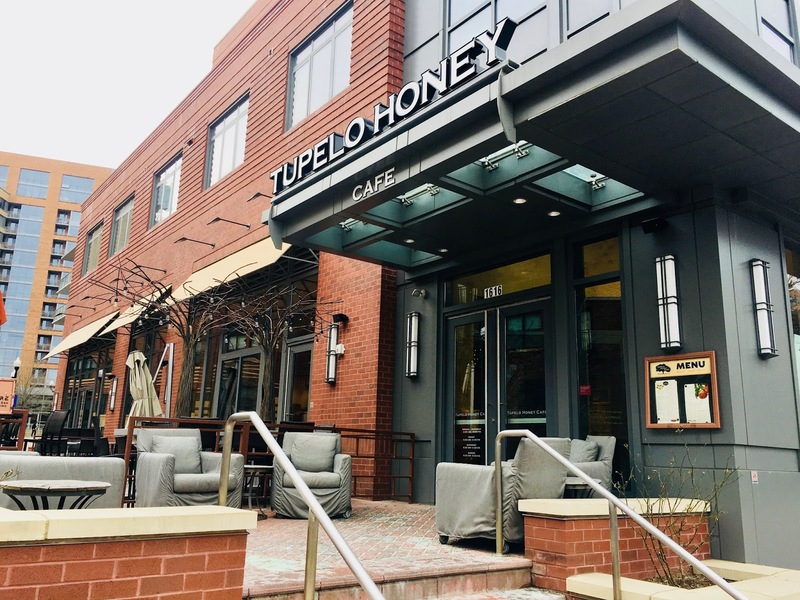 Tupelo Honey now has restaurants in Colorado, Georgia, North Carolina, South Carolina, Tennessee, Texas, and Virginia. Inside the atmosphere is bright and pleasant. Colorful, Southern-inspired paintings hang on the walls along with an American flag made of wooden posts. It's pretty cool. 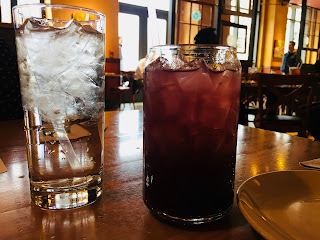 I started with a Sparkling Blueberry Punch that was very tasty. I inquired about the vegan options and was given a few dishes that could be modified, but not many. I'm sure the salads could be modified to be vegan, but I was in the mood for an entree. To start, I ordered the "Fried Okra with Carolina White Sauce," which when veganized was grilled okra with no sauce. I love that the chef was willing to accommodate because it turned out great! Slightly blackened and cooked perfectly, this okra was delicious. For my entree, I ordered the Grateful Veg Burger. Honestly, I wouldn't even have believed it was vegan had I not done so much research ahead of time. In fact, they have their own cookbook and the recipe is available online. They use tofu as a binder instead of egg. 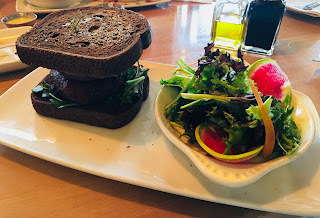 When I asked about the bun, I was told it was not vegan, but there were a variety of breads that were and I chose pumpernickel instead. And without the aioli. The housemade veggie burger was fantastic. Loaded with carrots, poblano chili, black beans, corn, bell pepper, celery, and spices, it was packed full of flavor. They put a huge slice of onion on top that was a bit overpowering and the bread was good, but probably not the best choice for this burger. Overall all though, it was great. I chose the side salad as my side and they said they didn't have any vegan dressings so I was brought oil and vinegar. Eh, I'll take what I can get. So, even though there's only one entree I can eat here, it was good and I'd come back again. The service was a bit slow, but the server was so nice and helpful that I really can't criticize. The prices were a bit high, but it's a nice restaurant so I expected that. Thanks for accommodating, Tupelo Honey, us vegans would love it if you'd add more vegan options too! A simple, yet nutritious broth. It'll take you just a couple of minutes to make this and it punches up the flavor of everything it is added to. This miso broth is one of Julie Morris' from Superfood Soups, a fantastic cookbook. She recommends using yellow miso, but I used the lighter white miso and it turned out great. Use this as a base for any soup! Blend all the ingredients together in a blender until the miso is fully dissolved. Use in soups as directed, or warm over low heat to enjoy as a sipping broth. The broth may be stored in the refrigerator for up to 1 week, or kept in the freezer for several months. 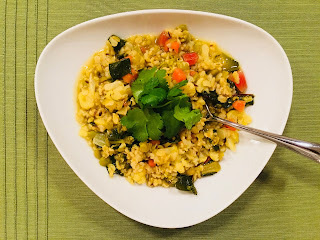 Kitchari is a famous mixture used in Ayurvedic medicine, which usually includes a starch, in the form of grains, and a protein, in the form of legumes. The recipe is used to balance the body in myriad ways--to detoxify, ease digestion, balance weight, and support recovery from illness or physical hardship. I found this recipe in a fantastic cookbook--Superfood Soups by Julie Morris. This soup will take some time to make, but the result is rewarding. 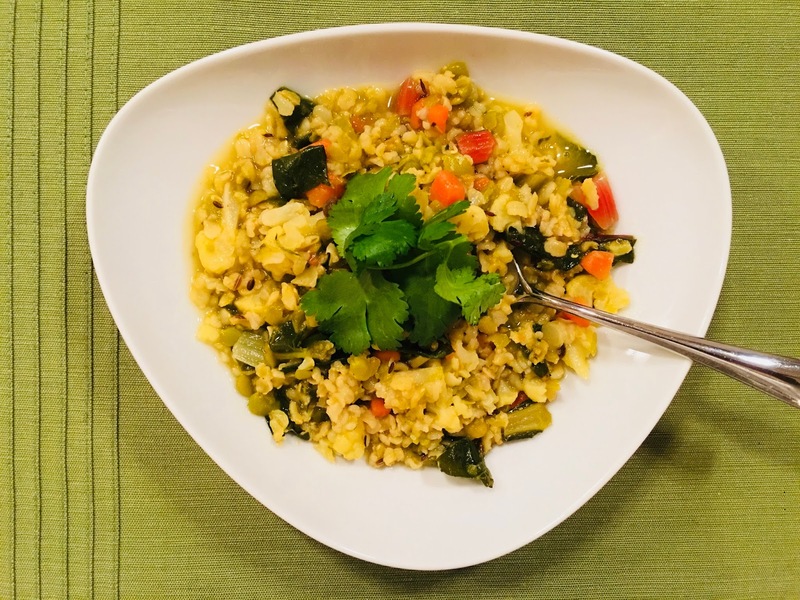 Split peas and brown rice make up the base as the carrots, cauliflower, and Swiss chard give it its heartiness and the super healthy aromatic spices give it its flavor. This soup should be made to be shared! Warm the coconut oil in a heavy-bottomed pot over medium heat. Once hot, add the cumin seeds, fennel seeds, and black mustard seeds. Cook, stirring, until the mustard seeds begin to pop and the spices are fragrant, about 2-3 minutes. Stir in the brown rice, yellow peas, coriander, turmeric, and ginger and cook for 1 minute longer, stirring constantly so as not to burn the spices. Pour in 6 cups of water and add the kombu strip, chaga powder, and 1 1/4 tsp sea salt. Bring the mixture to a boil over high heat. Cover, reduce heat to medium-low, and cook for 30 minutes. Stir in the carrots, cauliflower, and chopped Swiss chard stems, adding more water as needed. Cover the pot again, and cook for 30 minutes longer, or until vegetables, rice, and peas are very soft. Stir in the chard leaves and adjust seasonings if needed, adding more water if a soupy consistency is desired. Remove the soup from the heat and let rest until the chard is tender. Serve the soup warm with a little chopped cilantro. Note: Kitchari is immensely flexible in its ingredients and structure. You can use anywhere from 2 to 6 cups of any vegetable you enjoy in this recipe, such as zucchini and green beans. You can even swap out the rice for another starch and the peas for another legume. The Little Beet--how have I missed you all this time? 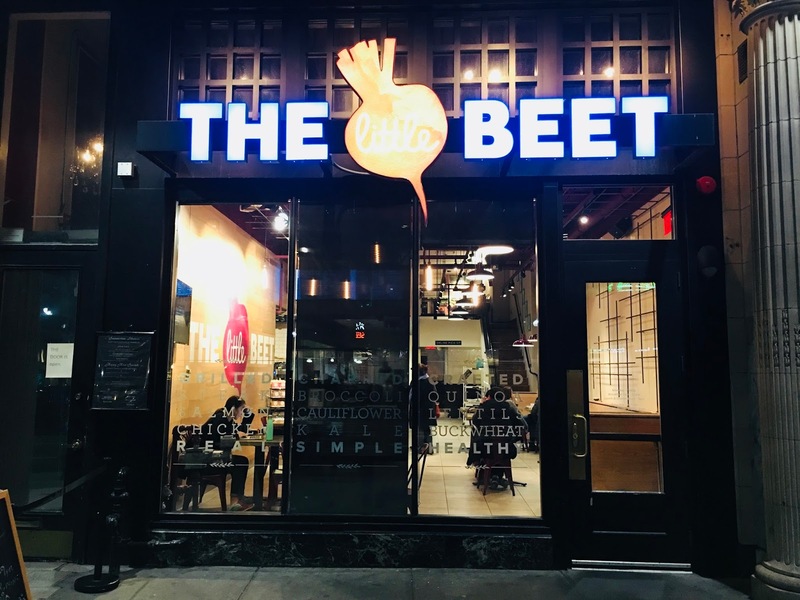 Apparently, The Little Beet, a fast casual restaurant originating in New York City, came to DC in 2015, but I guess I missed it. I was recently contacted by them to check out their new Rosslyn location, when I stumbled across their DC restaurant on my own. And this place is super vegan friendly! Better late, than never, I suppose! Inside, it's your typical small, fast casual setup with a typical style menu. Nice wood paneling and simple wood tables with beet colored chairs make up the dining room. My favorite part about their menu is that their online menu allows you to select "vegan" and when you do, it crosses out all menu items that aren't vegan. It's brilliant! 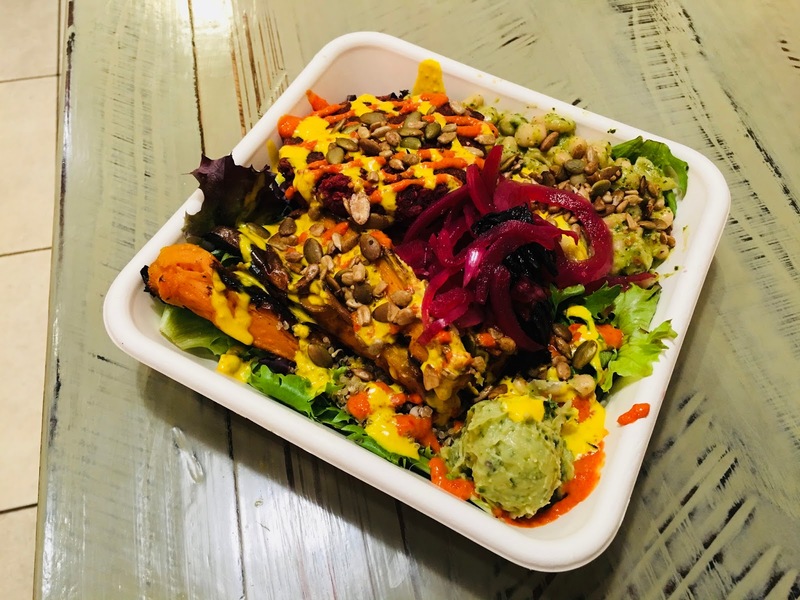 You can choose from two vegan chef-made bowls or you can make your own. I chose to make my own. I started with a mix of half of the little beet salad mix and half of ancient grain blend. Then you have your choice of tons of delicious cold and warm veggies and beans. I went with the white beans marinated in herb salsa verde and lemon and the sweet potatoes with smoked sea salt and olive oil. Other veggie choices are beets and lentils, roasted kale, cucumber and sea veggies, butternut squash, broccoli, and green beans. Vegans have three proteins to choose from: grilled avocado, tofu, or beet falafel. 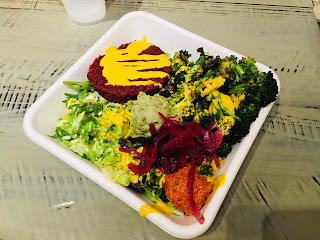 I just had to try the beet falafel, which they brought out fresh and grilled in front of us. Then, you can have as many sauces as you like, which is dangerous. 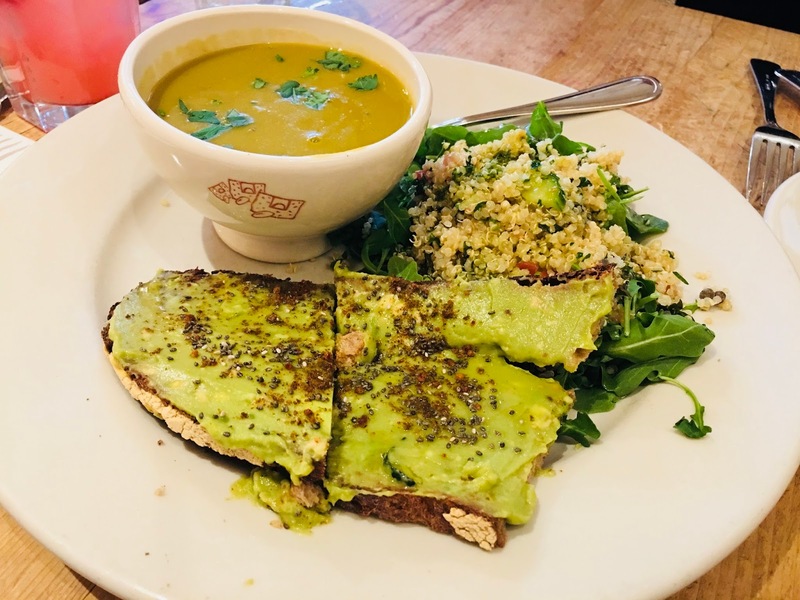 I chose the turmeric tahini, piquillo garlic, and avocado white bean spread. And then I topped it with pickled red onions and super seeds. Goodness, that is a lot of food! And it was really, really good! 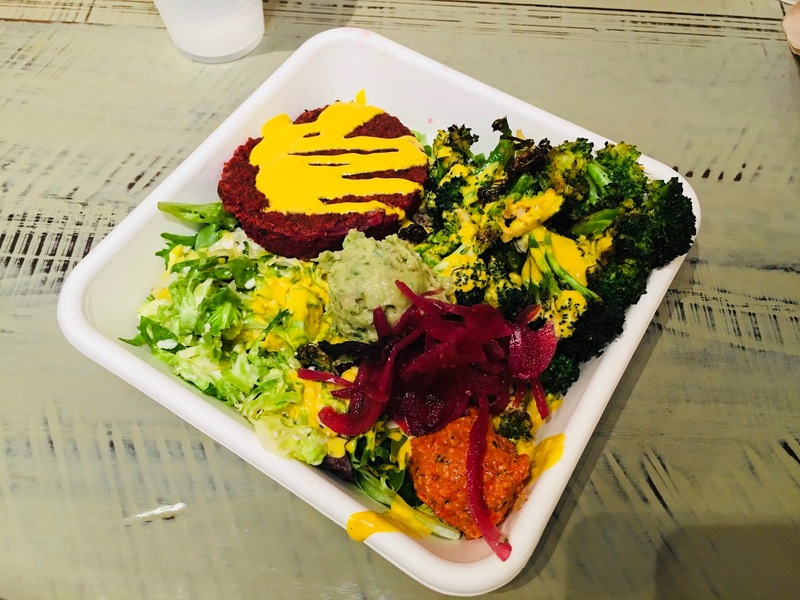 The beet falafel was really fresh as it was cooked right there in front of us and very hearty. The white beans and sweet potato were seasoned so well and all the sauces just made it all taste delicious. I was really impressed. My friend got a vegan bowl as well and raved about the broccoli. 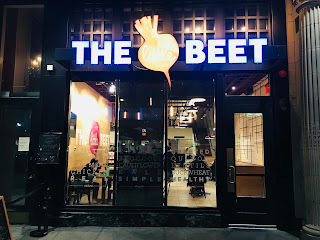 I can't believe it took me three years to find you, Little Beet, but I'll be back. 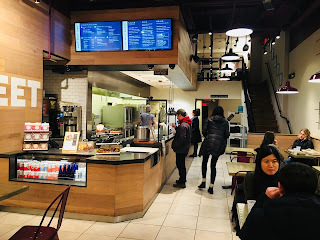 The price ended up being a little over $11 so a little pricey for fast casual, but the food was so good and fresh and the ease of ordering with the dynamic menu made for such a great experience. 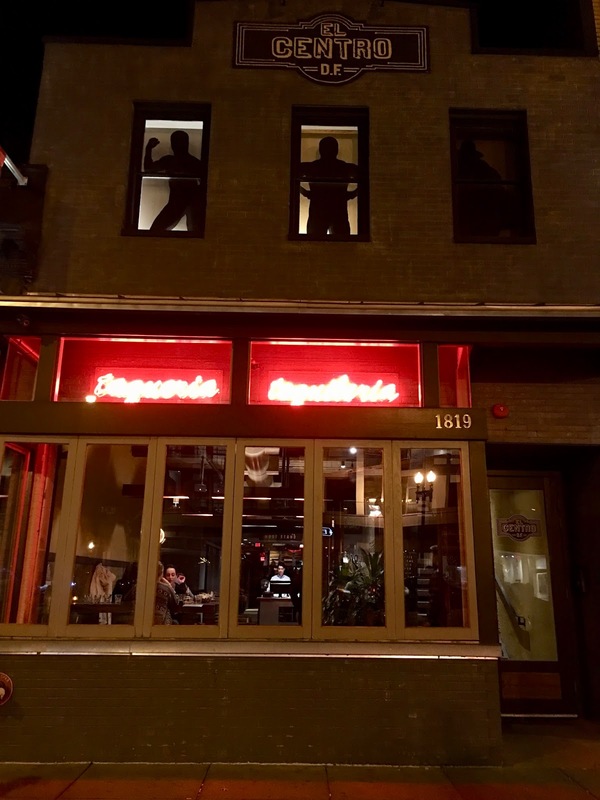 Please come support this awesome restaurant either in DC or Virginia! 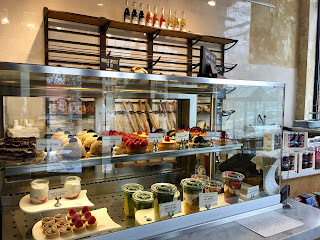 Oh, Le Pain, you are still one of my favorite international chains. 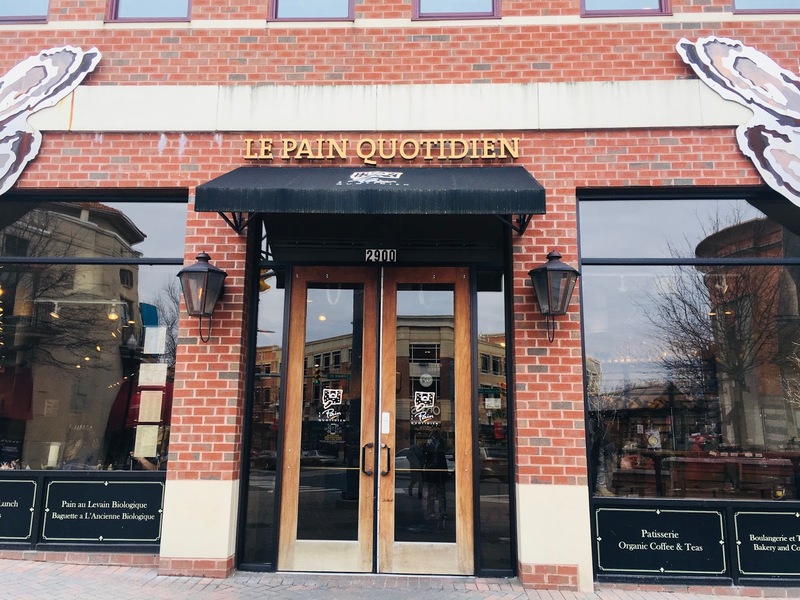 Meaning "the daily bread," Le Pain Quotidien originates out of Belgium and always has delicious food. 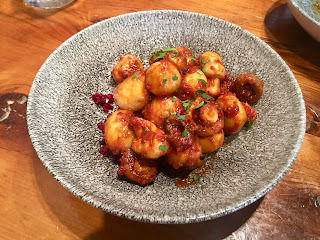 They change their menu often, but I'm always able to find good hearty food. 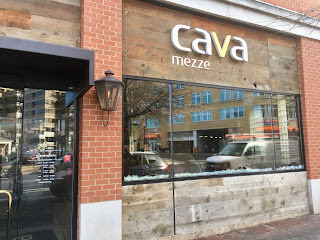 I recently discovered the Clarendon location in Virginia and visited twice. This location is quite large. You are surrounded by the warming scent of fresh baked bread upon entering and quickly directed to find a seat of your choosing. The dining room itself feels a bit barren with its light wood floors, tables, and chairs. The only accent is the white exposed ductwork in the ceiling--otherwise it has a very monocolor feel. 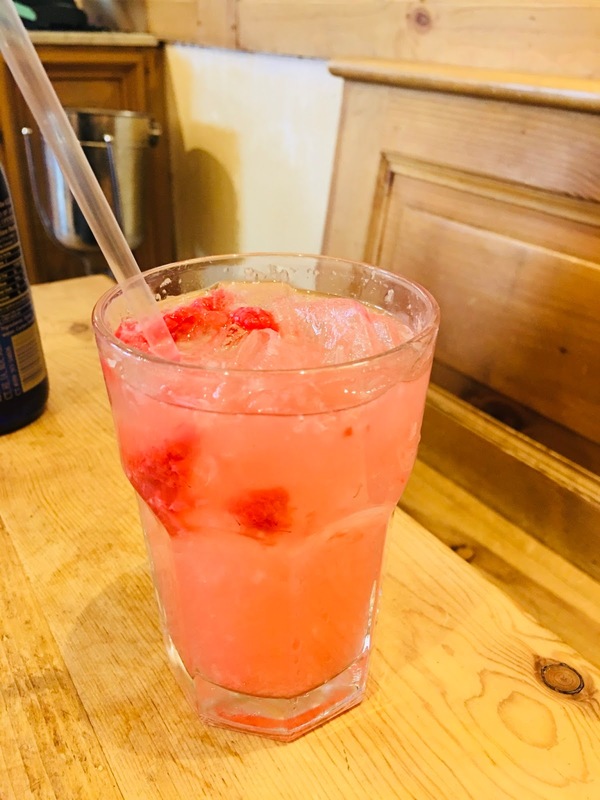 I started with a Raspberry Lemonade. Freshly made, it had a natural flavor to it--not too sweet and well balanced. For my lunch, I went with a seasonal special--the Sweet Potato and Black Bean Toast. 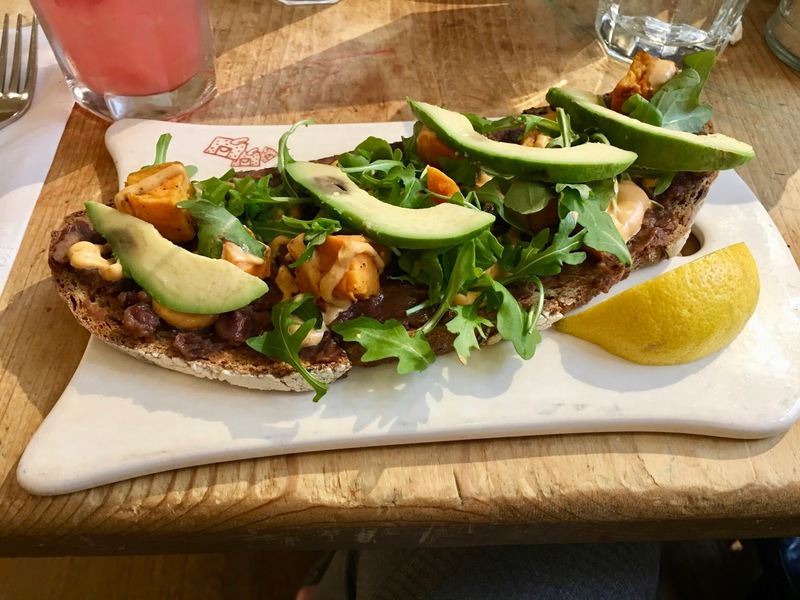 This beautiful, fresh toast was layered with sweet potato cubes, black beans, and arugula and topped with avocado slices and vegan chipotle aioli. Oh my my--it is so good. All those flavors meshed perfectly together. The bread was crispy, the sweet potato soft and the aioli creamy. And it was very filling. For my second visit, I ordered the Baker's Lunch, which consists of the soup of the day, a salad, and a tartine. The soup was split pea and was excellent. The salad was the quinoa taboule served with arugula--pretty good. The real star of this show though was the avocado toast topped with extra virgin olive oil, citrus cumin salt, and chia seeds. Do not go here without ordering one of their tartines! 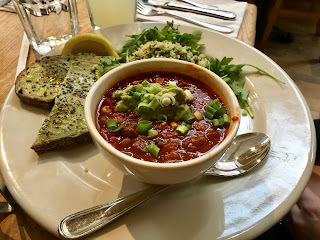 My friend got the same thing, but with vegan chili. It looked scrumptious! And I couldn't leave without my favorite vegan carrot cake cupcake. You must try one of these cupcakes--they are to die for! All in all, the service on our first visit was pretty good, but the second visit wasn't so great. The prices are definitely high for lunch at $12.95 for the toast and $14.95 for the baker's lunch, but well worth it as the food is fantastic. 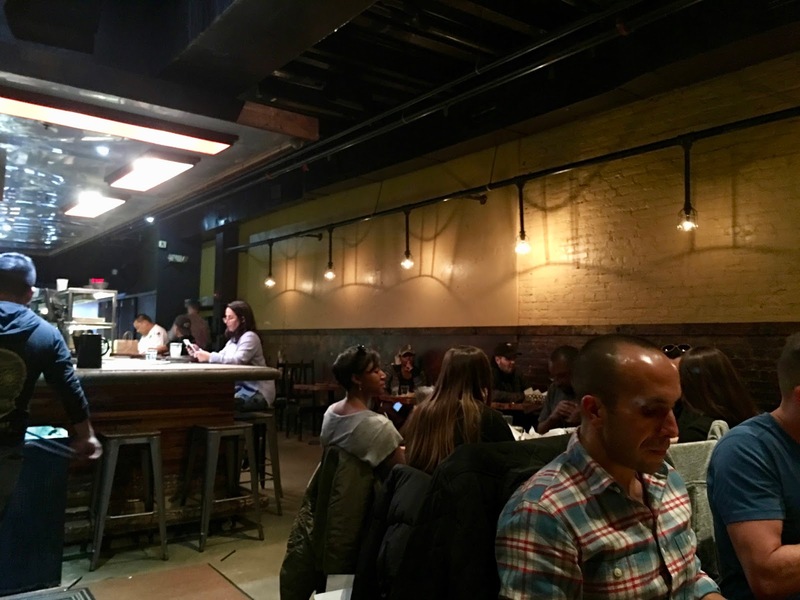 The atmosphere is pretty laid back there--no reservations needed. So, I'd say it's one of my favorite places to eat in Arlington...and really all of DC. Recommended. 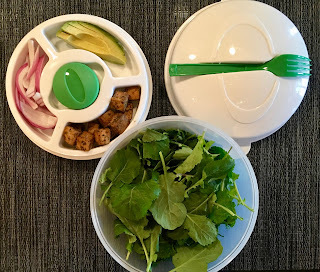 Quick and convenient--I think we are all drawn to quick and convenient meals because we are always on the go! And in comes Nasoya with a grand idea of pre-marinated, cubed tofu! 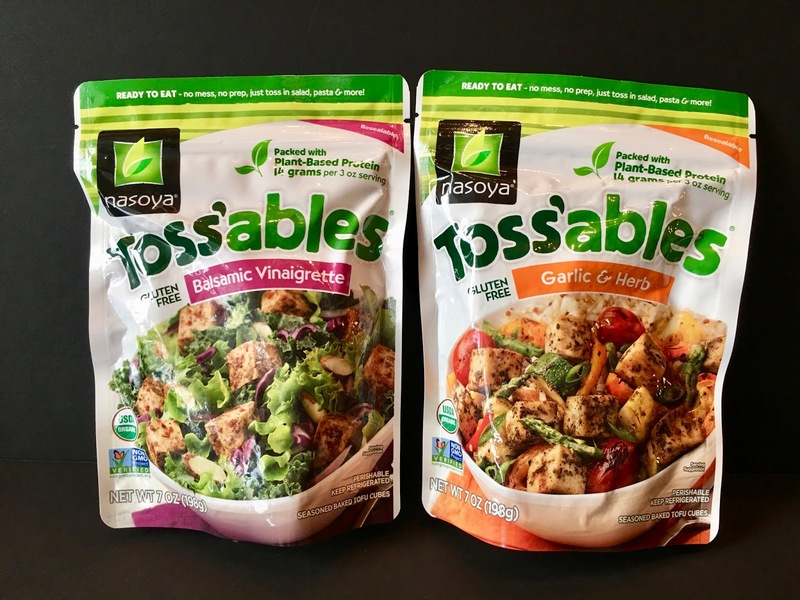 Nasoya sent me the new products in both flavors--Balsamic Vinaigrette and Garlic and Herb. 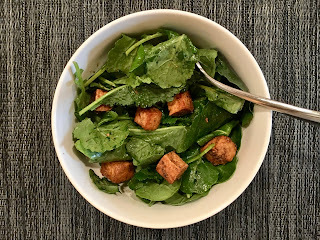 I absolutely love this idea because these flavorful, cubed pieces of tofu can be dropped into any wrap, salad, pasta, etc. right out of the bag! And the bag is resealable--it's like they thought of everything! 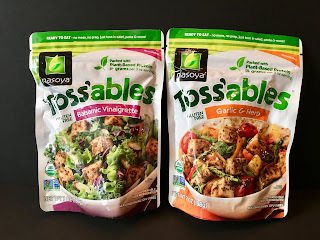 The first flavor I tried was the Balsamic Vinaigrette and I wasn't a huge fan. As someone who mostly has real olive oil and balsamic vinegar for dressing and not the salad dressing with all the fillers, this tasted a bit fake. Thankfully, they use organic tofu, but there are some weird ingredients in this pack like concentrated grape must, caramel color, tapioca starch, and xantham gum. All the other ingredients were pretty natural. Then, I tried the Garlic & Herb flavor and loved it! 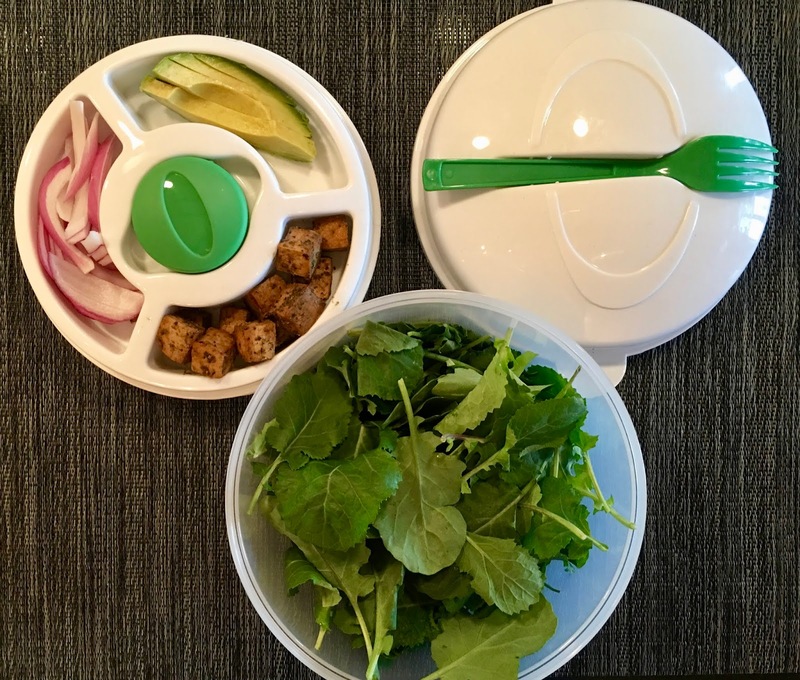 They also sent me this amazing bowl with a compartment on top for your salad toppings and dressing, complete with a fork! So, I loaded all my kale, tofu, avocado, and onions into this bowl and took it straight to work. The garlic flavor is strong and delicious. 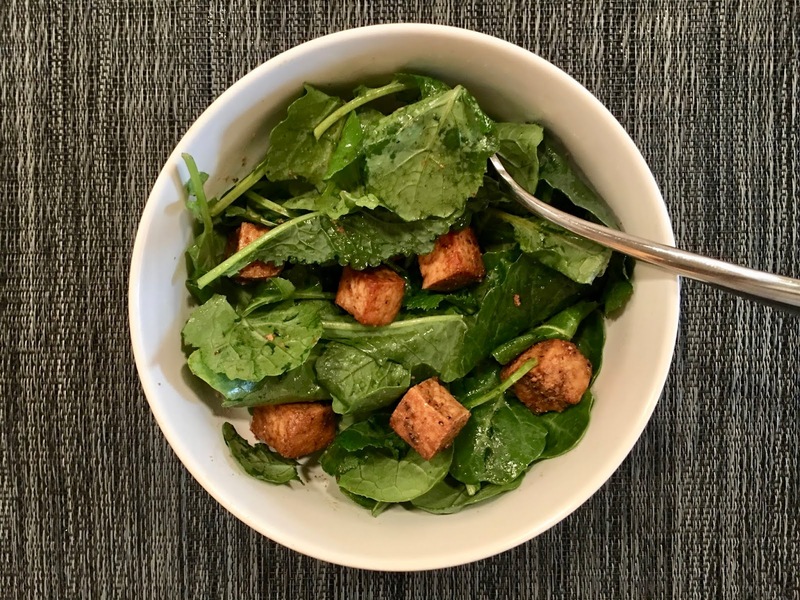 Although caramel color is also in this flavor, everything else is pretty natural: rice vinegar, garlic powder, organic canola oil, salt, onion powder, oregano, basil, and black pepper. My favorite part about these little cubes of joy are that they are super firm--great texture. There is also 14 grams of protein per 3-ounce serving. Also, they are gluten free, certified organic and Non-GMO Verified. So, although I didn't like one flavor, I love the other and I think the concept is a great idea! Thanks, Nasoya! You will find this new product in grocery stores like Safeway, Walmart, and HEB. Full Disclosure: Although the products were provided to me at no cost to review, that in no way influenced my veracious opinion. 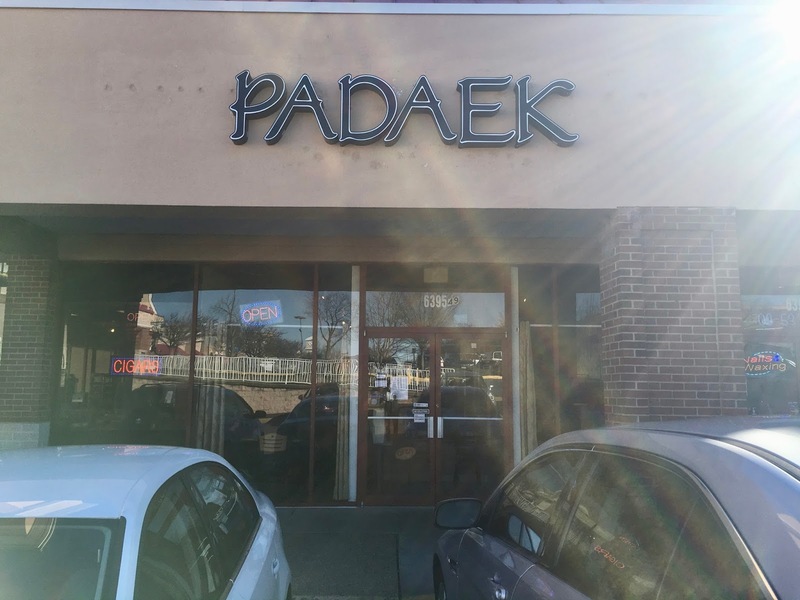 I was searching for a new place to go and stumbled upon Padaek, a Lao and Thai restaurant in Falls Church, Virginia. I discovered that Padaek is the old Bangkok Golden, which was very vegan friendly. So, off we went! Padaek is a small restaurant with Thai artwork on the walls and simple furniture. It was a busy Sunday when we arrived, but we were seated immediately. 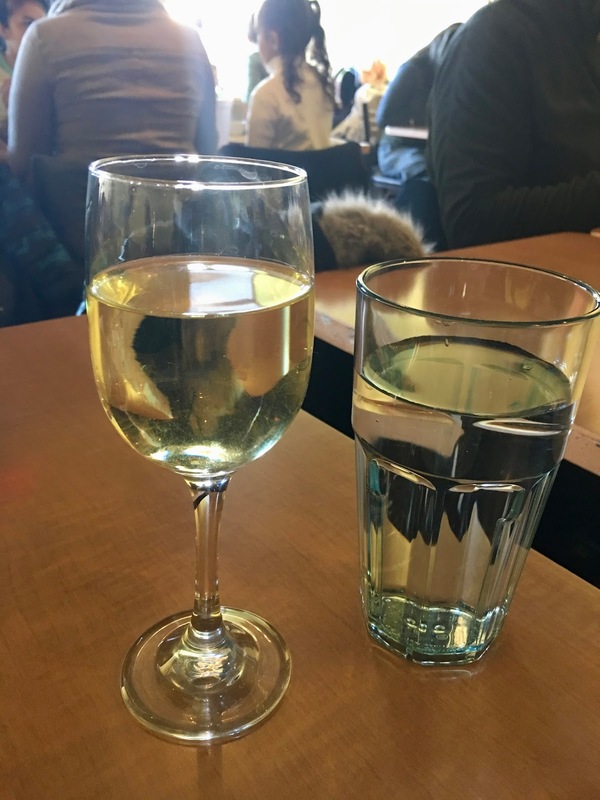 I ordered a glass of white wine as I perused the menu. The server didn't seem to know what was vegan, so she asked some people at the front, then came back to us. She basically said that very little on the Lao menu could be made vegan because it all had fish sauce in it. When she walked away, I noticed that some of the items she said that about were labeled vegetarian. That made me worry that they didn't understand the definition of vegetarian or vegan. So, we thought it safest to stick with the Thai menu rather than the Lao. We started with an order of spring rolls. We didn't realize they'd be as deep fried as they were. You know when something is so deep fried that all you taste is oil and nothing else?! Yeah--it was like that. There was mung bean noodles, cabbage, and carrot inside, but you could barely taste it. 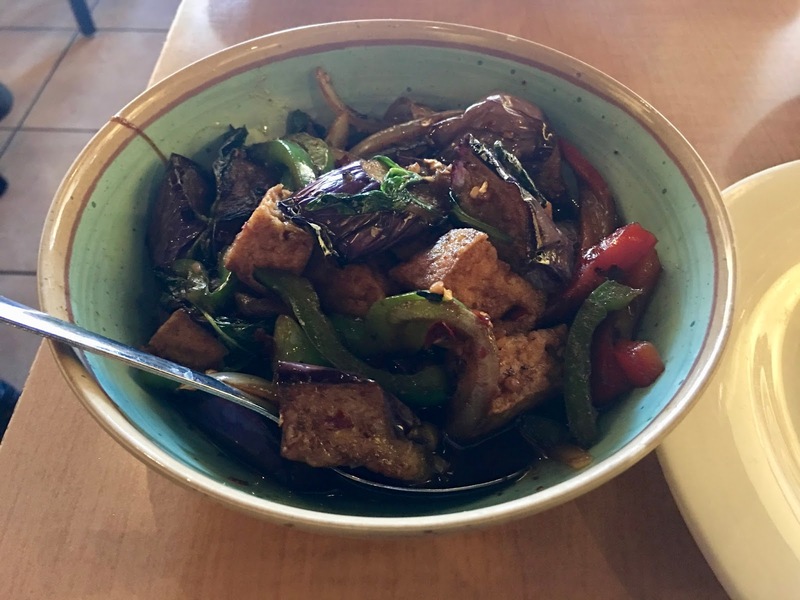 For our entrees, we ordered the Spicy Eggplant. I got mine vegan, no fish sauce, and extra spicy. This dish was really good. Japanese eggplant were sliced thickly and stir fried with onions and bell pepper with a chili-garlic sauce. It was served with white rice (brown rice was not an option). We ended up hanging out there for a while to catch up and luckily the place was clearing out so we weren't nudged to leave. I'd say this place is just okay. The fact that the vegetarian items are not vegetarian is not a good thing. 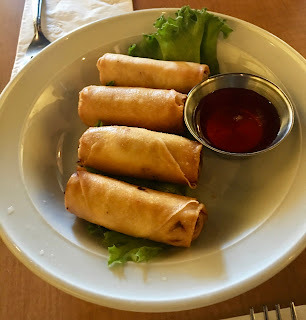 The appetizer wasn't good, but the entree was, but nothing about the experience made me want to go back there in an area with tons of vegan options. And we both had upset stomachs afterwards. 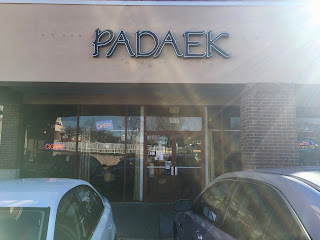 I'd say there are better places to dine than Padaek. El Centro is one of those restaurants that is always busy, always bumpin'. But, it wasn't until I was walking around the streets of DC with a friend who lives an hour away that I saw it and realized it's been years since I've been there. After checking many other restaurants who said they were booked at 5 p.m. on a Saturday, we decided to go to El Centro. I nearly forgot about all the controversy that had recently surfaced about their "no sneakers" policy and how it was applied in an effort to discriminate. I walked in wearing sneakers and no one said anything. As busy as they were this early in the day, I was hoping there was a table available and there was. Hooray! Before sitting down, I inquired about the vegan options and the hostess wasn't sure. The lady who came up to talk to us also wasn't sure and said the usual, "you can have the green salad." So, I took the menu and asked about the veggie tacos and she went and talked to the chef and he said that, of course, he could make them vegan. Great! 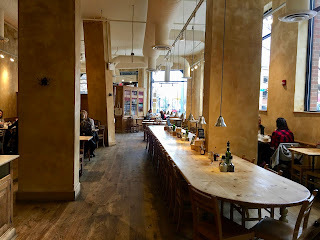 We were seated in the dining room on the top floor with the open kitchen. El Centro has this warehousey feel to it with the dark walls and exposed ductwork. On this particular visit, the music was loud, as were the patrons. It was definitely happy hour. 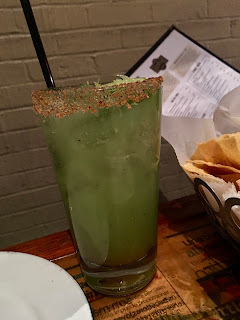 I started off with a Pepino--a spicy margarita made with serrano infused blanco, agave nectar, fresh lime, and fresh cucumber. I liked it, but it wasn't nearly as spicy as I was hoping. 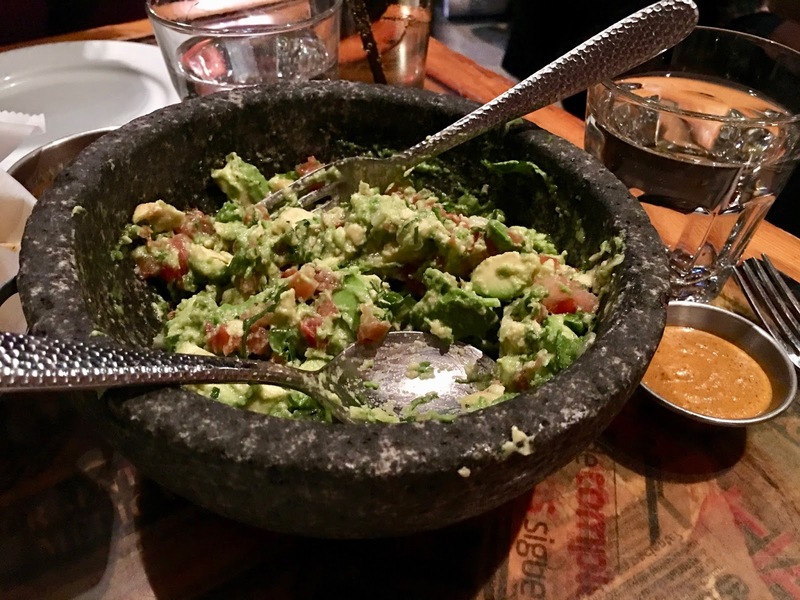 We also ordered the Traditional Guacamole served with chips and salsa. 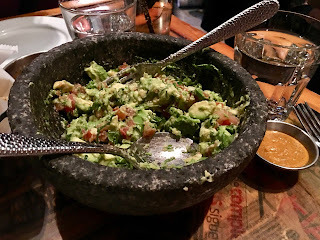 It was pretty good, but definitely not the best guacamole in the city. And the presentation could have been better. Our server, Luis, was fantastic. He was so nice--addressing all of my questions about what is vegan or not. There really were only a few options--salad or tacos, but he was able to tell me that the rice and beans that come with the tacos were vegan and that the veggies were cooked in oil and not butter, etc. So, I went with the Roasted Heirloom Vegetable tacos sans the cheese. 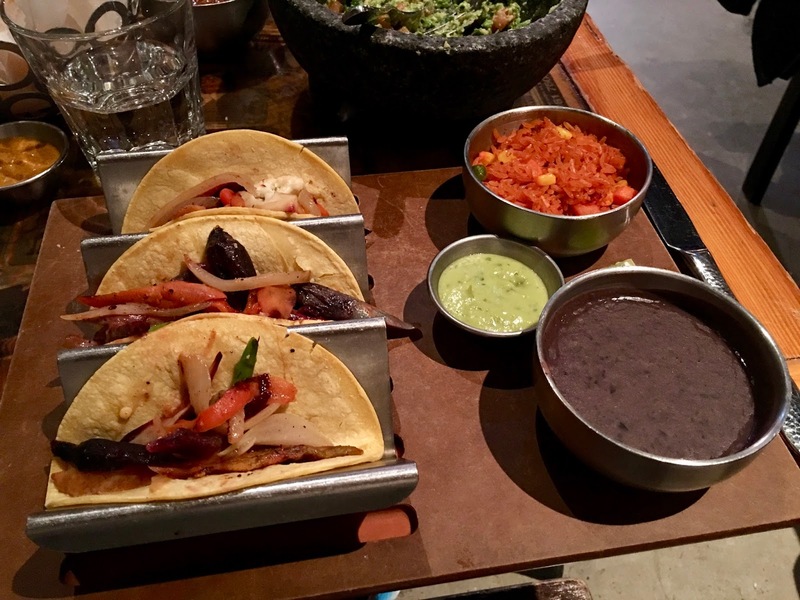 The roasted vegetable tacos had lots of different vegetables like cauliflower, carrots, onions, and root veggies sauteed in fresh tortillas. I topped them with the guacamole and they were pretty good. But, surprisingly, the best part of this platter were the black beans and rice. The rice, in particular, was seasoned so well and cooked perfectly with fresh peas and carrots mixed in. Yum! The server even gave me their habanero sauce to add to my food and it was not only hot, it was really good! This turned out to be a good choice. The atmosphere was fun, drinks good, and food really good. The prices are on the high side with the tacos being $15.50 and the drink $11, but the service was so good that I didn't care. 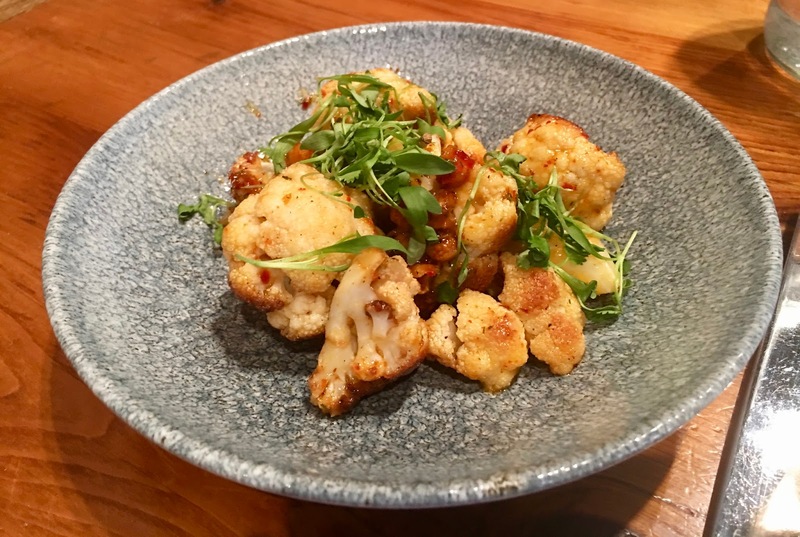 And when you spend so much time out of town eating awful veggie fajitas in Mexican chain restaurants, El Centro is a welcome upscale spin on Mexican food. 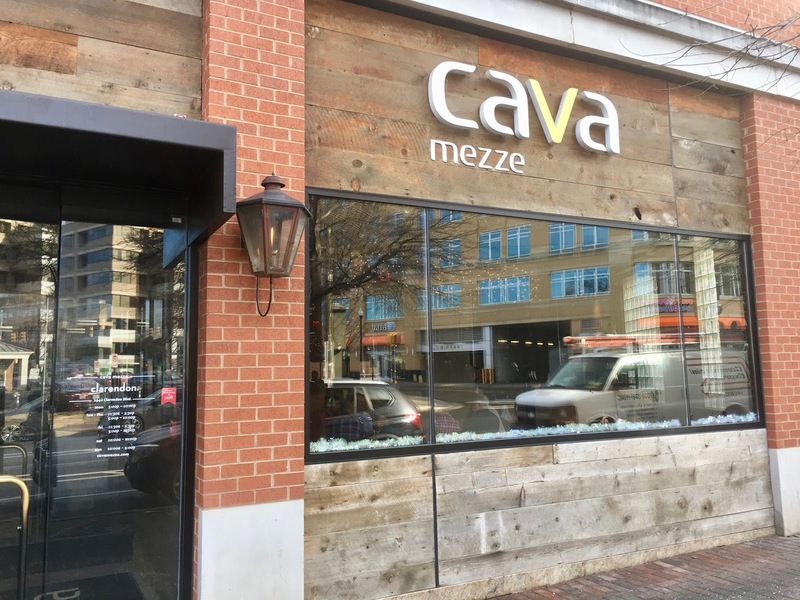 Cava Mezze is best known in DC for its fast casual Cava Mezze Grill concept, but they actually have restaurants as well. There are five locations and I had previously only been to the one in NE DC. This time I ended up in Clarendon (Virginia). 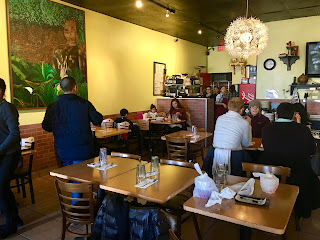 Inside, the restaurant appeared relatively small. It was noon on a weekday and there were just two of us--we were seated immediately. 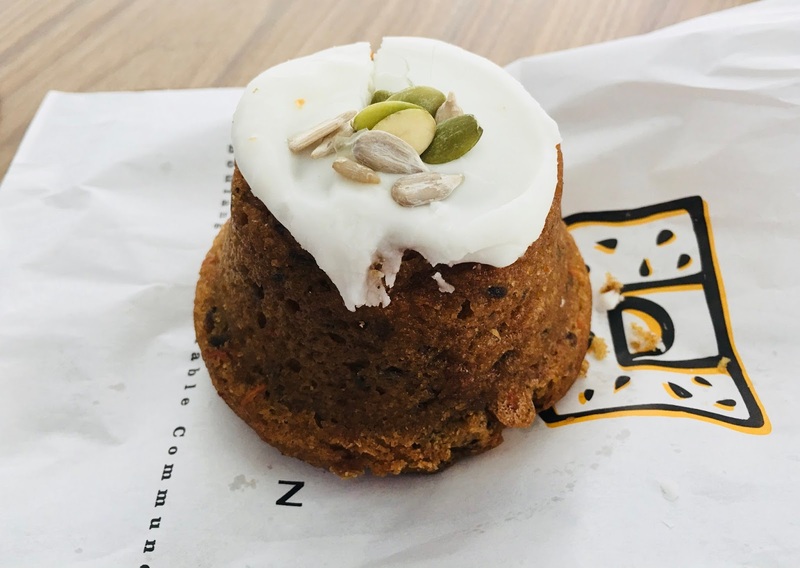 They gave us the lunch menu, but when I asked what was vegan, they brought me the mezze menu of all vegan mezzes that is available for lunch or dinner. Very nice. Our server brought some complimentary pita, harissa, and olive oil to the table. Yummy. There was a rustic feel to this restaurant. It was dark with dark tables and chairs and exposed ductwork painted black. 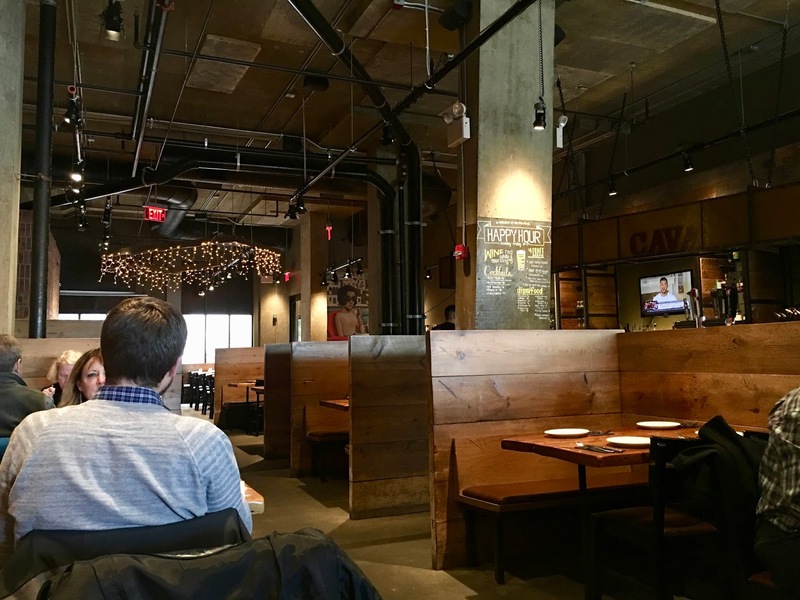 The booths had high walls, which left the bar basically hidden behind the booths. 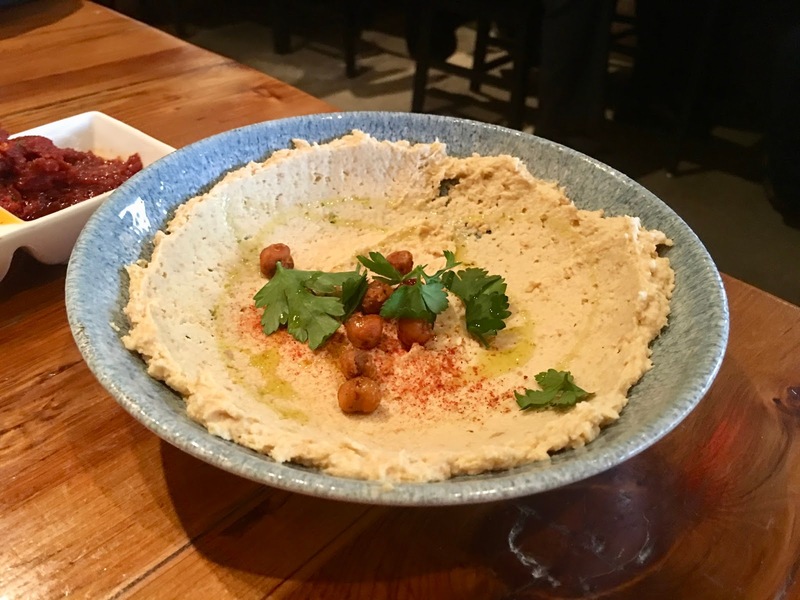 We started with an order of hummus. It was good hummus, but there wasn't much of it. They took the hummus and spread it along the edges of the bowl so it barely covered the edges and there was nothing in the middle. So, we had to take the bread and run it along the bowl. We found it a bit odd. 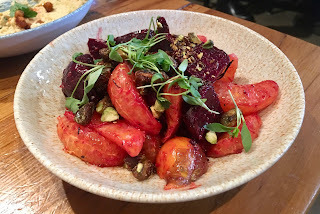 Our favorite dish by far was the Baby Beets, which had roasted red and golden beets, tangerines, candied pistachios, and lemon. 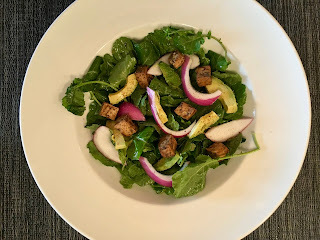 For some reason, this dish normally has a honey aleppo dressing that is listed on the vegan menu so be sure to request it vegan without honey. Next up was the Roasted Cauliflower made with crispy chickpeas and spicy dill vinaigrette. This was pretty good, but a little too sweet for me. The Spicy Mushrooms were weird. They were button mushrooms covered in warm harissa and beet sauce. The Broccolini was probably my least favorite. The menu said it was grilled, but I'm sure it was steamed. 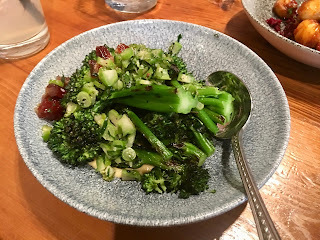 So steamed broccolini covered in dates, olive oil hummus, and scallions is what the menu said. I didn't see any hummus. This dish was clearly missing something. The service was okay. We had to hunt the server down to get our check. The mezzes are the typical high price you get in this area of $8 to $12 each. And the atmosphere was okay. In the end, I have mixed feelings about this place--a few dishes were good, a few were not, and they have a non-vegan ingredient on their vegan menu, which isn't right.